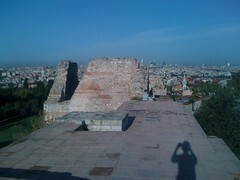 view from the top of the city wall. it's so crazy that everything is so old. like, 1500 years old. this is looking east, so what you can see best is the skyscrapers of the business district where the bridge across the bospherus is.